Geek Lit Etc. : Manga Monday: How cute can the cute girl in class be? Manga Monday: How cute can the cute girl in class be? It might not be polite to point out a classmate's differences, but perhaps some things might need to be cleared up in Shiba Inuko-san Volume 1. It's actually refreshing to see someone in Japan who is accepted for all of her eccentricities. Students everywhere can be very unforgiving of classmates, and in as cohesive a society as Japan, standing out too much can sometimes be frowned upon. Chako Ishibashi is just a normal 8th grader at a normal school. She has a few friends in her new class, and a little brother Yuuto who she walks to school with in the morning. She's in a different class this year in school, which is exciting, because it's the same class her friend Naho was in last year, and they seened like suh a close, friendly bunch. She's Shiba Inuko-san. Everyone agrees that she's short, and adorable, and brown-haired,and has a small tail, and irresistibly cuddly, but for some reason only Chako seems to have put all the pieces together that she's actually a Shiba Inu dog. But what does that matter, really? Inuko-san is still adorable, and a good friend to her classmates, and participates in whatever they're doing. She might not be the best person to share notes with if you're absent with a cold, but she's sure mastered chopsticks at lunch. A standard 4-koma manga, Shiba Inuko-san Volume 1 never tries for more plot than it's able to actually pull off. Each story is basically a middle-school slice of life, with some sort of dog-related twist. Surprisingly, it stays fresh much longer than one might expect. The author uzu has somehow hit upon the perfect combination of absurdity and normalcy, and it blends very well. Highs: Any time Shiba Inuko-san runs up against a problem based on her form, and the rest of the class - minus Chako - takes it in stride, the reader can't help but smile. Lows: Fans who have become bored with the abundance of slice-of-life manga recently may find some of the tropes repetitive. 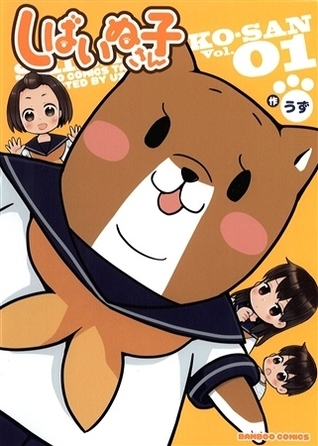 Verdict: Shiba Inuko-san Volume 1 is exactly what it sets out to be, and does it well.